Lemon and white chocolate? For breakfast? All wrapped up in a tender oat muffin? Yep - that's right. This is a great little recipe that requires a little preplanning (you must prepare the oats an hour before you begin), but is actually quite easy and versatile. I happened first upon a rhubarb muffin recipe that sounded good, but wasn't. It ended up being a fairly upsetting experience because I excitedly used my very own homegrown rhubarb (nearly clear-cutting my plants to get enough). As the muffins cooked, I imagined the deliciousness that was sure to come (I love rhubarb). Unfortunately, the muffins were a dismal failure. The sugar was virtually undetectable - they were downright sour. The cooking time was all wrong. When the muffins finally did cook through, they turned out heavy (probably too much rhubarb). Crestfallen, I dumped the poor things into the trash. You've got to get back on the horse, though. So, I kept searching and found an oat muffin that looked just great (from Simple Bites). With no more rhubarb to use, and a desire to stay away from the same-ole blueberries, I decided to make lemon muffins. And I love white chocolate with lemon, so it was an obvious choice. I topped them with a yummy streusel and that was that. So, make some today for breakfast tomorrow. You won't be sorry! 1. For the streusel: In a small bowl, stir together the flour, sugars, and salt. Use a fork and/or your fingers to mix in the butter until thoroughly incorporated. Cover and chill until ready to use. 2. 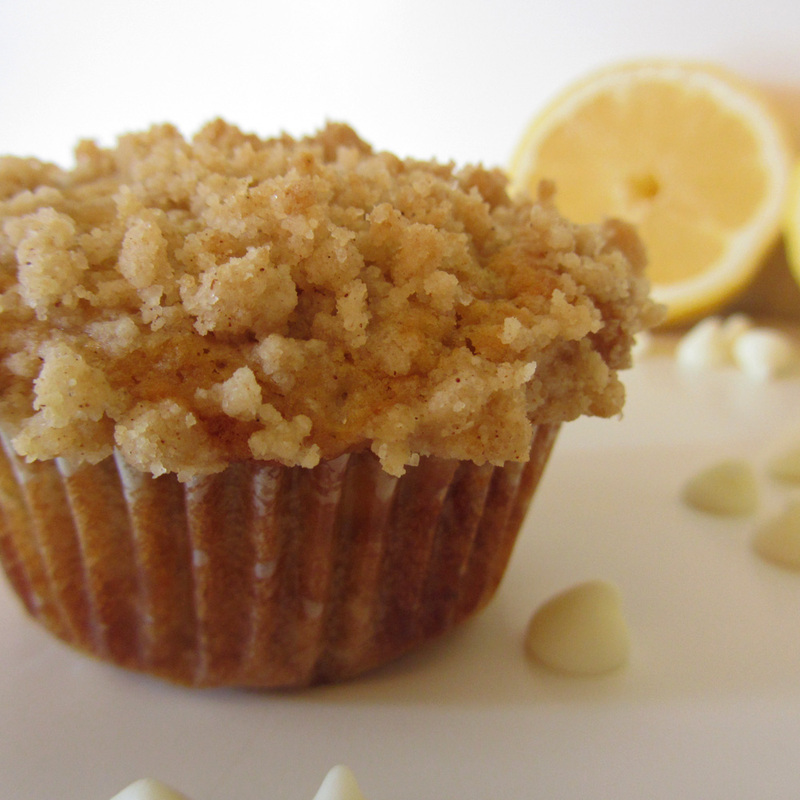 For the muffins: in a medium bowl or large measuring cup, stir together the milk and lemon juice. This will make "soured milk" (milk will thicken and may clump). Stir in the oats. Cover and let sit at room temperature for one hour. 4. In a medium bowl, whisk together the flour, baking powder, baking soda, and salt. Set aside. 5. Stir the lemon zest and brown sugar into the oat mixture. Stir in the egg. Stir in the butter and lemon extract. 6. Make a well in the center of the dry ingredients. Pour the wet ingredients into the well. Stir gently until just incorporated. Stir in the white chocolate. 7. Scoop the batter into a paper-lined muffin pan. This recipe makes 12 muffins. The cups will be full - these muffins don't rise much. 8. Remove the streusel from the refrigerator. Break the pieces into small clumps. Top each muffin cup with about 1 heaping tbsp of streusel. 9. Bake for 15-20 minutes or until a toothpick inserted into the center comes out with only a few crumbs attached. 10. Allow the muffins to rest in the pan for 10 minutes. Transfer to a rack to cool.